hello... Back when Youth With A Mission started in the 60’s, it was with the vision of taking young people into the nations and making a difference. This is still true today. At the heart of the gospel is the need for a demonstrable expression of the love of God to the world around us. There are many ways this can be done, and as you go through this edition of our newsletter you’ll read of a number of opportunities our community is responding to in the wider community around us. All of our Discipleship Training Schools offer a practical, overseas placement as part of the course. 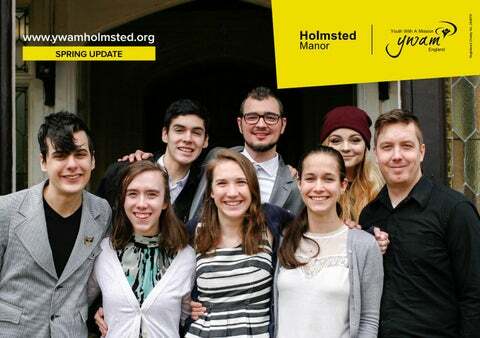 One of the things we do at Holmsted Manor is to ensure that our missionary endeavours aren’t limited to an overseas placement, we also aim to see our Holmsted Manor community actively engaged in practical placements locally too. During 2016 and into the start of this year, our Holmsted Manor YWAM community has worked with refugees and migrants in France, Greece and Germany. We have had the opportunity to build a house in South Africa for a family in need and closer to home, we have been involved in the Brighton and Hove Churches Night Shelter 2017, from the beginning of January until the middle of March. These are our more ‘corporate’ efforts, aside from this, there are some on our team who volunteer with local charities and other initiatives, working alongside people who for various reasons are in need of a helping hand and support. At Holmsted Manor we are committed to loving our neighbours, at home and abroad. their children’s views on the past year and hearing what the children were hoping for. There was often so much more hope for the new year in the children than in the adults.” Afterwards, the SoMD travelled to Greece for their next two weeks. As the five members of the team prayed before departure, it became clear that God was speaking to them about working with the Greek people. The time in Greece was split between Thessaloniki, where they worked alongside a new YWAM team and Corinth, working with a prayer room ministry where they had the joy of seeing a young Corinthian man find faith in Jesus. “LEARNING TO LISTEN TO GOD CAN BE HARD, BUT IT IS GOOD AND E S S E N T I A L I N O U T R E A C H E S .” The time in Greece was short and the team went without having lots of plans scheduled, Kimberley Sullivan said; “We were unsure of what to expect when we left… by waiting on God’s plan for each day we had a very different outreach than we expected, but we all felt that we hadn’t missed anything”. Berlin Outreach Every DTS is split into two phases; lectures and outreach. During the last two months, the Autumn DTS has been on outreach in Berlin living and working with the YWAM team located there. Most of their time was divided between three types of ministry: prayer, working with rough sleepers in an overnight shelter, and supporting YWAM Berlin’s work with refugees. Prayer walking is often a part of DTS outreaches, but becomes rather difficult in below freezing weather. As a creative solution, the team decided to travel on the underground train network praying as they go. They were hoping to cover as much of the massive city of Berlin in prayer that they could in their short time. “OUTREACH HAS BEEN SUCH A FULL EXPERIENCE: FULL OF CHALLENGES, FULL OF LAUGHTER AND FULL OF GOD’S TRUTH” - SETH, USA When the team arrived in Berlin the YWAM community was only working in one refugee home as one closed suddenly at the end of 2016. Over their time there they helped get into two more homes while the longest running one closed during their last week of outreach. While in the homes they played with kids, drawing and playdough, with the teenagers and some of the adults they played ping pong, table football, and cards. Still with other adults they simply drank tea and had conversations. Several of the refugees have developed deeper friendships with the long term YWAM staff. Over the course of the outreach the team saw one individual completely change the direction his life was heading and even begin attending some of the YWAM Berlin open meetings. The trainees exceeded all expectations and YWAM Holmsted has received an open invitation from Berlin to send more teams as it was such a mutually positive experience. by members of the YWAM community – even down to having real-life babies playing the newborn Jesus. This year the team decided to take their live performance up a notch, including a dancing Gabriel played by one of the base leaders and a French King Herod who brought some comic villainy into the interactive show. The performance was excellent and was the best attended Live Nativity yet. During the event, base staff Daniel and Tamara Jackson organised a wonderful café serving hot drinks and a vast array of international sweet treats which were very popular with the visitors! The third and final event of the weekend, Carols at the Manor, offered a more traditional carol service that was flavoured with the breadth of cultures represented at YWAM Holmsted Manor. The evening was led by Steve Bishop, who added his usual touch of humour to the evening’s proceedings. To lead the musical segments of the evening, the base welcomed the all-female local community choir, the Singing Allsorts, to accompany some of the base’s musicians in rousing versions of everyone’s favourite Christmas carols. With Holmsted Manor at its most beautiful and the whole YWAM team involved, the Christmas events were a huge success. Holmsted Manor became a hub of the local community, welcoming in guests of all ages and offering a reminder of the true meaning of Christmas. CHAMPION YOUNG PEOPLE YWAM is called to champion youth. We believe God has gifted and called young people to spearhead vision and ministry. We are committed to value them, trust them, train them, support them, make space for them and release them. They are not only the Church of the future; they are the Church of today. We commit to follow where they lead, in the will of God. A modular course designed for those with a busy life. To help you in your personal growth and put it into practice. Barry and Kay Austin were at Holmsted Manor from 1976-1983. During that time, they ran the first DTS in Europe and developed the Basic Leadership School (BLS). From 1977 Barry was the base leader. During his time at Holmsted, Barry felt God directing his attention to staff development and mentorship. He felt that as a mission YWAM would be far more effective in accomplishing the great commission if the staff were constantly growing in their character and walk with God. It was at Holmsted that Barry really began to understand the importance of small groups. The BLS developed at Holmsted has led to what is now the Leadership Development Course (LDC). The LDC focuses on giving leaders keys to developing their leadership skills. Barry leads LDC around the world and is responsible for them in the Asia/Pacific region. To younger YWAM staff, Barry urges that they remember to keep the first commandment the first priority in their lives. Loving, worshipping, listening and obeying God in all they do. He then encourages them to earnestly seek to develop the relational skills to obey the second commandment; loving people. The final bit of advice is to continue developing the gifts and abilities that best enable them to fulfil their part in the great commission. Barry and Kay live at the Kingâ&#x20AC;&#x2122;s Lodge in Nuneaton. Brighton night shelter outreach From November to March the churches in Brighton and Hove across the city, open their doors to the homeless and vulnerable every night of the week, providing the 15 referred guests with a delicious hot meal, a warm bed and a space for conversation and friendship. From January, YWAM Holmsted Manor was invited to use a city-centre church location to co-ordinate the ministry on Wednesday nights. The dedicated volunteer team consisted of staff and trainees from Holmsted Manor alongside a number of others who attend local churches, bringing together the rural West Sussex community and the urban community in Brighton. From 8pm til 8am, the team were available to serve the guests in any way they could; be it cooking the meal; playing pool with them; listening to their stories or offering prayer. 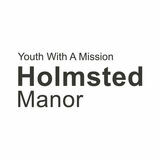 For YWAM Holmsted Manor, it was an exciting new opportunity to expand our expression of mercy further outwards, while obeying the call of Jesus to love and serve the most vulnerable in society. GO SOMEWHERE DO SOMETHING MAKE A DIFFERENCE We are looking for two groups of men to undertake building a whole house from foundations to roof. Spend two weeks of your summer deepening your relationship with God as you join an outreach team and work alongside experienced missionaries in a cross-cultural setting. Location options are focused mainly in Eastern Europe, and include a variety of ministries that give you the opportunity to share the gospel, serve in practical ways, and help you explore what it means to be a missionary both overseas and at home. Over a few days in 2017 you could help build a house in a South African township for a family in desperate need of one. This short trip will give you the opportunity to see your work impact the lives of those you meet. This isnâ&#x20AC;&#x2122;t just a summer camp, this is missionary training!